Alongwith the Open faced pies with Arabic dressing made and posted last time, I thought of making it a whole meal with Eggplant dip and pickled vegetables on side. I have been smitten by the strong Moroccan flavors for a while. 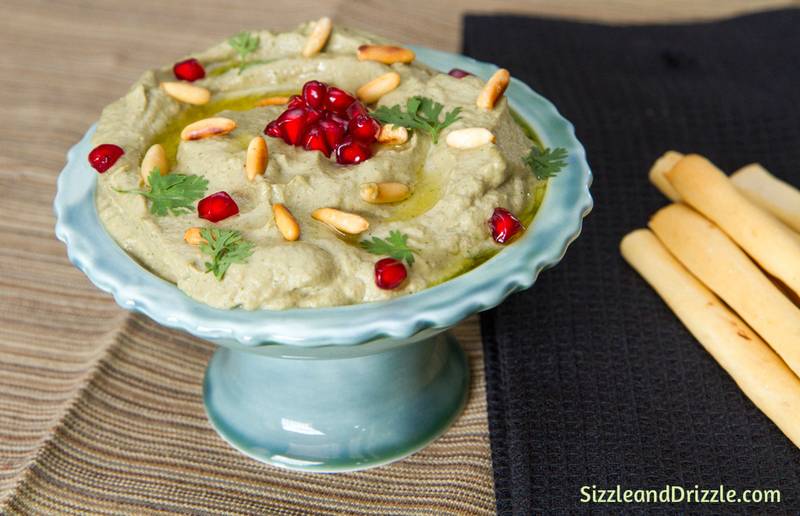 There is no mistaking the sumac in the pies, and similarly, the robust eggplant flavor delicious mingles with tahini and coriander in this dip. Several years back, the first time we went to a Moroccan restaurant called Bisto Grill in Mumbai, we had the ‘Baba Ghanoush’ . The name sounded exotic, the price was steep, and hence we expected something ridiculously fancy to show up on our table. But all that was served was a salad made of roasted eggplant with some sautéed onions. Totally bland and flavorless. Duh! So much for expecting an Aladdin come out from his lamp carrying a sizzling smokey Baba Ghanoush! It was disappointing and I wished I could make it at home. That was back then, when I literally didn’t know how to cook anything. Ofcourse, priority list was different then. I had to first study well and clear my Chartered Accountancy exams. Several days on end, I wouldn’t ever enter the kitchen. Even if I did, all I had to do was chop onions, or wash coriander and similar stuff. Only help mom whenever she particularly “asked” me to.